3. I've purchased the program but still don't have the activation code. 4. I've purchased additional licenses, but my new activation code activates the wrong number of licenses now. What should I do? 6. Do I need administrator privileges on my computer Windows User Account if I want to install Email2Task? 7. Will I lose all Email2Task settings if I reinstall the program? 8. Does your product work with localized Outlook versions (German, Spanish, French, etc.)? 9. The trial version we have downloaded has now expired, and we didn't get the chance to test it properly. Is there any way we can download and try it again for another 14 days? 10. I downloaded the product trial a month ago and now I am trying to install it. But I get the message "Your trial is over". What should I do? 11. I have downloaded the trial version of Email2Task and it says I need to activate the program. 12. How do I upgrade from the previous product version to a new one? You can use your credit card, PayPal, wire transfer, or check (for US only). All these options are available when you order a product from our website. All software from our website is downloadable, but you can also order the 4Team BCD, which contains installation files and documentation and is sent by regular mail. Yes, we do. Send us your NPO statement of exemption by fax and indicate the name of the actual purchaser and his/her e-mail address where we can send the Promo Code that will generate a 15% discount. We e-mail Activation Codes within 24 hours after the purchase. But on workdays we usually send Activation Codes within 1 hour. Please send us an e-mail or call us if you don't receive it within this period. Yes, you can get free e-mail and Live Help support in order to install and tune-up the program properly. Please, check the Support part of this Help for more information. Yes, you need to have Administrator rights to install Email2Task. Yes, it does, but there are no localizations (the product will be in English) of the product. We can make them by request as custom order. You can also help us translate Email2Task for these localizations. We can send you the necessary simple docs to translate. Please, send us a trial extension request to support@4team.biz. Please, provide your name, phone number, your team size, and describe the purpose of the extension. Please, refer to 4Team Customer Support by e-mail or via Live Help. The 14-day trial version does not require any activation. If you do get this message immediately after installation, please contact our Customer Support for help. You must uninstall the previous version (go to Control Panel > Add or Remove Programs) and download and install the new one. 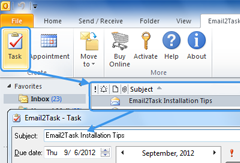 Find 4Team Outlook Email2Task and Click Remove.